Part of a collection of lamps created using the �BOZZOLO� technique: manually applying �threads� of moulded glass on a pre-shaped element of blown crystal. 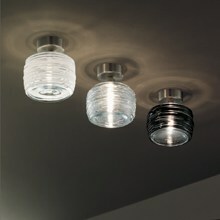 Options include white, black, crystal, or transparent topaz glass threads. Metal parts are in satin nickel.